Having a backup and recovery plan for your business data is more critical than ever before. Without a plan, your business can suffer from permanent data loss, unnecessary expenses, and massive downtown. With these threats looming overhead, a majority of SMBs still go without having a backup and recovery plan for their business data. Here are five reasons that will (hopefully) change your mind. Losing Data is Simple – when technology experts talk about data loss, people always think of catastrophic events, which is not how most data disappears. 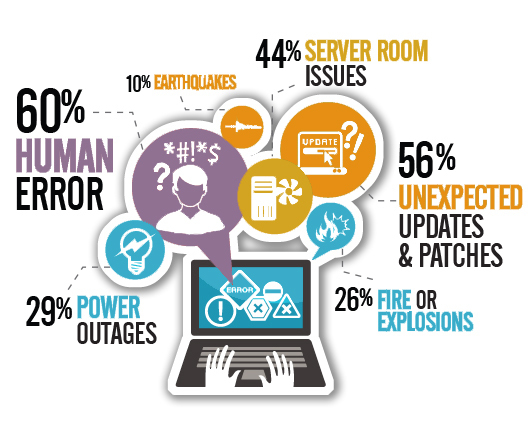 Human error and hardware malfunction are much more likely causes for data loss in your organization. These are hard to prevent and happen in a variety of “everyday” situations. Cyber Attacks – while everyday situations are the most common form of data loss, know that all data is a target for cyber-attacks, especially for SMBs. Information is valuable to hackers, and it doesn’t matter what your business type or size is. Downtime – when you lose data (from any reason) the downtime that you endure after that loss is more than just irritating, it makes it hard or impossible for you and your employees to get their work done. If you have no way of recovering essential files, you will be forced to start your recovery process from scratch. Invaluable Data – some of the documents or files that your business has is invaluable. If lost, it might be impossible to continue doing business. These could be client lists, research history, or data on your next big breakthrough. If you don’t have a backup and recovery plan for this type of data, what will you do when it disappears one day? Reputation – do you have client data or healthcare records for patients? How will you begin to tell them that it’s gone? Your reputation is vital to your business. You want to make sure that you’re doing everything to keep that information safe and secure. Backups and recovery of this information could be what makes or breaks your business reputation. We offer a variety of backup and recovery options to customize a solution for your business. Contact one of our Account Managers today to start the discussion of a recovery plan for your organization.